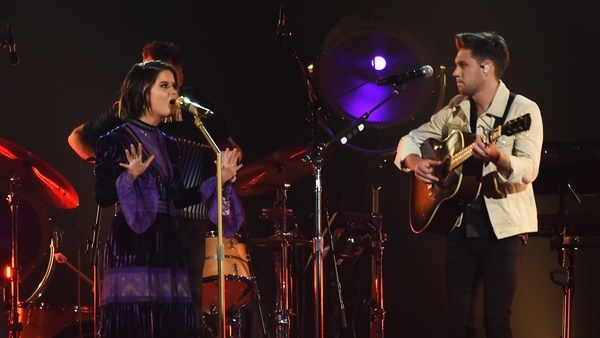 Niall Horan said he has had a "hell of a year"
Niall Horan scooped the Best New Artist Award at the star-studded American Music Awards ceremony in Los Angeles on Sunday night and also performed his hit track, Slow Hands. 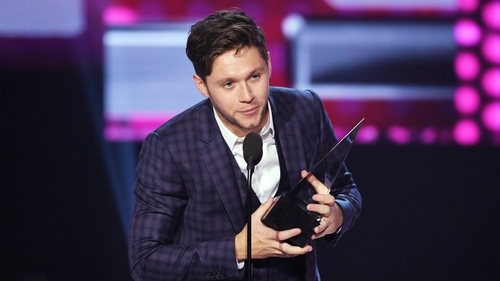 The 24-year-old star, who hails from Mullingar, said it was "unbelievable" to pick up the coveted award after a "hell of a year". Horan, whose debut album Flicker hit the top spot both here and in the US triumphed over fellow contenders James Arthur, Julia Michaels, Post Malone and Rae Sremmurd. Also picking up awards where Bruno Mars who won Favourite Artist and Coldplay who won Tour of the Year. Pink and Kelly Clarkson opened the ceremony with a cover of R.E.M. 's Everybody Hurts, before host and Black-ish actress Tracee Ellis Ross said the nominations reflect a year of music in the US. "A year where brave women have started a movement as we own our experiences, our bodies and our lives. You heard me?" she added. Her mother, Diana Ross, was handed a handed a lifetime achievement accolade and closed the show at the Microsoft Theatre with a medley of her hits I'm Coming Out and Take Me Higher. "I really, really love being here and I feel so humbled by this," she said. In a recorded message sitting alongside her husband and former president Barack Obama, Michelle Obama celebrated Ross for reaching "folks of every race, background and walk of life". Imagine Dragons won favourite pop or rock group, and singer Dan Reynolds said the US had faced too many divisions in the past year. "This is the country I know, which is of powerful women, talking about our women, talking about empowering our LGBTQ youth," he added. Lady Gaga performed from her show in Washington DC and was presented with Favourite Female Pop or Rock Artist. "You just remember, that if you feel different, or you feel not understood, don't you dare give up on who you are - you fight like hell for what you believe in," she told her fans. Selena Gomez also impressed fans with her first live performance since she had a kidney transplant. No women were selected for top categories including artist of the year, video of the year or tour of the year. Organisers said the nominations are based on music sales, radio play, streaming figures as well as interactions on social media and tours. Halsey criticised the gender balance as a "missed opportunity", adding she was "really disappointed to hear near exclusively male names". She received two nominations for her collaboration with The Chainsmokers on Closer but was not up for a solo award despite having a number one album in the US this year.